f The Bugbytes: Giggling with Dad! This is Jen, with 3 Cats and a Bug. Thank you again Pam for asking me to join your amazingly talented Design Team!! 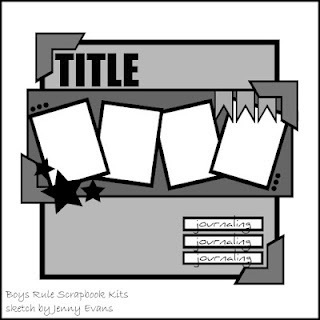 For today's layout, I used a sketch from Boys Rule. I used 2 cricut cartridges on this layout, Lovely Floral and Picturesque. I started out with a 12 x 12 piece of blue cardstock. Then I cut a dark blue piece at 10.5 x 10.5 and then a patterned paper at 10.25 x 10.25. I cut a green piece at 6 x 11 and used yellow paper as photo mats cut at 3.25 x 4.75. I cut one set of photo corners from Picturesque at 3 and one at 4. I added glossy accents to them, although I may change them since I didn't care for how they turned out this time. The stars are 1/2 inch, left over from another project. The word giggling was cut from Lovely Floral at 2.5. I cut the blue word and then I used my gypsy and cut the dark green word using the hide contour button. I cut the banner from Lovely Floral as well, using my gypsy again to cut them at 1.75 x .75. I used my white gel pen to add some details to the banner. I used liquid pearls to add the 8 dots and the dots to the two "i"s.
Please come visit me over at 3 Cats and a Bug. This layout is adorable!!! Love your take on the sketch!! Cute baby! Love the sketch and your take on it, as well as the color selection.